There is a certain memory of a busride in 2011 from Vilnius to Druskininkai and the experieced landscape – the vast territory. 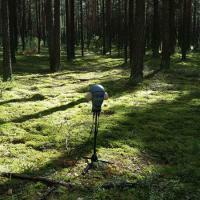 In Episode 2 binaural recordings in the woods around Druskininkai are used – a journey with my artificial ears into the living silnece of the woods. These sounds ask for devotion, for the willingness to listen INTO and to enjoy this animate silence thereby. Rare it has become to get to experience an acoustic landscape without aircraft noise at minute intervals. Rare it has become that people take their time to perceive small changes. Do we need a hundred-year sleep so as to have time to listen into the depth? And to give this planet time to recover from us humans? Audio Field Report no. 25 / Soundactivism 4 (March 2015): Interview with, or audio guide by Elisabeth Schimana. Idea: Knut Remond. Ltd Edition audio cassette, 8 copies numbered. Schimana's award-winning and internationally performed work spans the gamut of composition and free playing, is inextricably bound to her as a live performer, makes reference to historical positions, but resists all attempts at categorization, and stands out, strikingly and reduced, with tremendous intensity.